Are you curious about what hypnobirthing is all about? Do you want to learn more about how you can best support your hypnobirthing clients? The Hypnobirthing Australia philosophy is that we are all working with the same goal in mind – to help birthing mothers have a safe, calm, and positive birth experience. The Hypnobirthing Australia program absolutely recognises the difference that supportive caregivers can make to this goal. 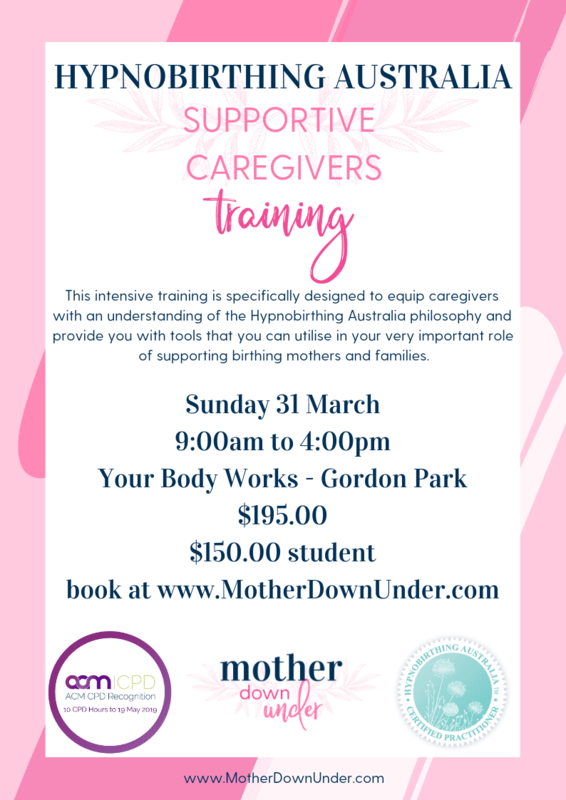 This course has been designed especially for you – medical professionals (doctors, midwives, student midwives, doulas, physiotherapists, massage therapists, acupuncturists, osteopaths, chiropractors…anyone who has meaningful contact with pregnant women) who wish to learn the basic philosophy and tools of hypnobirthing so that you can best support clients who choose to use this method of birthing. This intensive one day workshop is specifically designed to give you an understanding of the hypnobirthing philosophy and provide you with tools that you can utilise in your very important role of supporting birthing mothers and families. 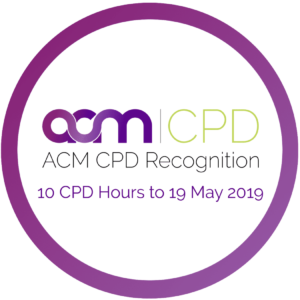 This course is endorsed for 10 CPD points by the Australian College of Midwives. The class is held at The Workshop at Your Body Works, 112 Thistle Street, Gordon Park. Cost includes all course materials, morning tea and afternoon tea. Lunch is not provided. We will break for an hour and you are welcome to purchase your lunch from nearby cafes or bring your own (there is a fridge and a microwave available at the venue). There is plenty of free parking around the venue. Participants of this intensive training are not qualified to teach the Hypnobirthing Australia Program – however, if you are interested in our Practitioner Training please click here for more info.